LEXINGTON, Ky. – Just five field goals over the final 10 minutes of regulation saw KU’s halftime lead slip away as the No. 8/9 Kentucky Wildcats sprinted past the No. 9/10 Jayhawks, 71-63, Saturday night inside Rupp Arena. Redshirt junior Dedric Lawson led the team in scoring for the ninth time this season and posted his NCAA-leading 14th double-double by way of his 20 points and 15 rebounds. The loss moved the Jayhawks to 16-4 and marked KU’s second loss in the six years of the SEC/Big 12 Challenge. Kentucky claimed its sixth-straight win and now sits at 16-3 in 2018-19. It was a cold-shooting start by each side in the opening minutes. Over the first 6:30 of action, both teams combined to go 5-of-24 from the field, which included a 0-for-7 clip from beyond the 3-point line. 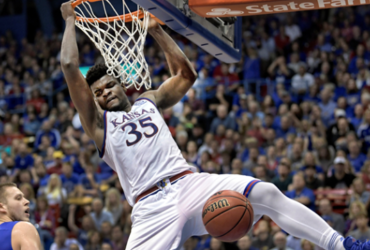 But the Jayhawks shook off the rusty start and, with Ochai Agbaji’s triple at the 13:19 mark, KU exploded on a 12-0 run to build an early double-digit lead, 16-6, just over midway through the opening half. Kentucky’s Reid Travis used his prowess in the paint to quickly get his team back in the game. The graduate transfer pulled down four of his six first-half rebounds and scored seven points on a 9-2 UK spirt that helped the Wildcats claw back to within three points, 18-15, with 7:25 to play in the first frame. Lawson helped keep the Jayhawks in front, collecting his double-double before the halftime buzzer by scoring 11 points and pulling down 11 rebounds within the first 18 minutes of the contest. The Jayhawks managed only two field goals over the final 4:30 of the half, but four free throws from Marcus Garrett and Lawson helped KU hold on to the narrow margin, 33-30, as the teams broke for intermission. After the restart the Kentucky 3-pointers began to fall. The Wildcats hit a trio of triples within the first nine minutes of the second half to put KU on its heels, facing its largest deficit of the game at 52-44 at the 10:44 mark. The cold shooting then returned as both teams managed just a field goal apiece over the next four minutes. 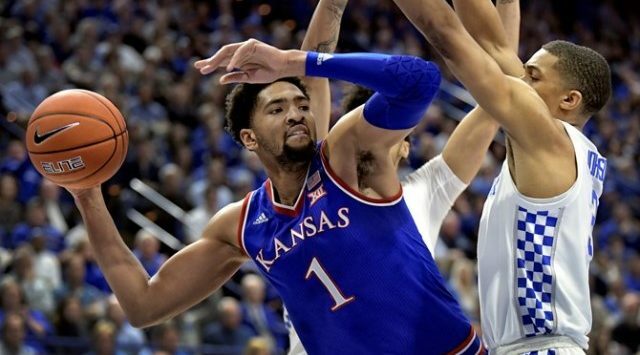 A pair of Quentin Grimes triples helped KU stay close despite the Wildcat offense coming alive. His trey at the 4:33 mark pulled the Jayhawks within 57-52 in the midst of a 15-7 UK blitz. Unfortunately for the visitors, Grimes’ two threes were two of just five KU field goals in the final 10:20 of regulation. Lagerald Vick connected on a pair of threes in the final 1:20 as Lawson added a third triple with 20 seconds left, however the Wildcats closed the game going 9-for-10 from the charity stripe to keep the Jayhawks’ late push a harmless one, closing out the 71-63 victory. Lawson closed out his 14th double-double of the year by way of his 20 point, 15-rebound outing. The Memphis product also added a pair of assists, a steal and a block. Grimes and Vick were the other two Jayhawks to score in double figures, posting 13 and 10 points, respectively. KU’s 36.5 percent (23-of-63) clip from the field marked its lowest of the season, while UK’s 17 free throws marked the second-most by a Jayhawk opponent this season.